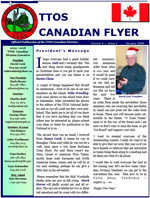 All issues of the Canadian Flyer feature: President’s report. Door prize and raffle prize winner photos, Upcoming events & club meets, Editor’s corner & a few surprises! These reports are made available in *.PDF (portable document) format. In order to read *.PDF documents, you must have Adobe Acrobat Reader installed. If you do not have the Reader installed, you may download it FREE. 2013 November V11.9: Kelly’s Caboose. York report and pictures. Chilliwack and Lyndon shows. David Cook in Ontario. 2013 October V11.8: Sept BBQ. AGM & election. 2013 Great Edmonton Model Train Show. Ann Elizabeth Hildred. BC Rail TOFC announced. Peter Tofield layout corner. 2013 June V11.6: Olivia retires from KP. BA Oil prototype. Layout corner: Trestleosophy 101. Dave Cook at George’s Trains. 2013 May V11.5: BA TOFC on the way. Layout corner John Constible. Editorial by Charles Reif, on the new CTTA. 2013 April V11.4: Marius train collection. Announce BA Oil trailer on PGE flatcar (TOFC). Layout corner Gary & Katelon. Cocolate choo choo. Island show. 2013 March V11.3: New logo in the works for CTTA. Layout corner Eli Bryan Nelson. 2013 February V11.2: Update now that we are CTTA. How Canada got its second transcontinental railroad. 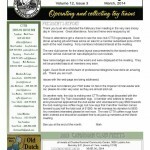 2013 January V11.1: President’s report: announcing that we are now CTTA, Operating night, Puyallup show. Frank Horne. Marius Vos. 2012 November V10.9, V10.8: Bus trip. Name the Club contest! Choose a logo. September BBQ. TCA PNW outreach. York, PA trip pics. York UK National Railway Museum. 2012 September V10.7: Independence Vote. BA tanker almost sold out. TCA Atlanta convention pics. 2012 June V10.6: Call for withdrawal from TTOS. BA tanker sales & pre-production art. 2012 May V10.5: The Brighton and Rottingdean Seashore Electric Railway. Layout Corner – Ken Lockley. Coors Light Express – Charles Reif. 2012 April V10.4: BC Rail flatcar sold out. Mark’s Operating night. Announcing BA Oil tanker. Canadian Cars parade pics. The Christmas Miracle – John Constible. 2012 March V10.3: PGE tanker sold out and delivered. Special edition Weaver BC rail bulkhead flatcar. Dr. Klinker’s Ocular Blinkers, by Eli Bryan Nelson. PRR Museum and National Toy Train Museum pics. Lionel instructional videos. A Real Canadian Railway tale. 2012 February V10.2: PGE tankers shipped. Order BC Rail TOFC. Layout corner Vies Szalanski. Bridge rectifier workshop. Cabinets of curiosities – Vies. 2012 January V10.1: PGE tanker update. Bus trip and York pics. Hoge Streamliner at Nanaimo. Train station watches. Charles Reif backdrop & scenery workshop. 2011 November V9.9: Dr. Klinker – A Celestial Tribute to Toy Trains. New Jersey Hi-railers layout pics. York, PA report & pics. 2011 October V9.8: Exec board relected. Meeting fee approved. Lynden, WA show pics. All Canadian Top 10 – Brian Torch. Dr. Klinker in Burnaby. Canadian Top 10 by Province. My Old Station House – Clark Gray. 2011 September V9.7: Summer BBQ. CP reefers arrive. Terry Bellinger. Exec proposal to raise meet fees. White Pass & Yukon. Sacred Places Top 10 railfan sites. Dr. Klinker. 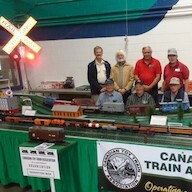 2011 June V9.6: Nanaimo meet report. A bit of Canadian Railway History. Dr. Klinker in TTOS? 2011 May V9.5: CPR Reefers on the way. Hobby links. 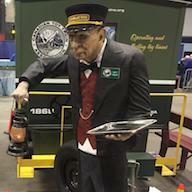 A short history of toy train motive power – Charles Reif. Peace Arch bridge. Who done it? Part 1. 2011 April V9.4: Mark’s 1st open house in Surrey. Three rail roach – Marchie. PNW/Can Div meet at Bellingham Railway Museum. 2011 March V9.3: Greetings from Australia. Jersey Hi-railers. Club wear. Margaret McCoy. Bill Campbell’s photo review. 2011 February V9.2: Announce PGE tanker. The King’s visit – Robin Tivy. Munroe show pics. Layout Corner: Mark Horne under construction. Twisted tracks pics. 1939 Royal Train roster link. 2011 January V9.1: BB&BC boxcar shipped. Mark & Laura open house. Charles Reif layout pics. 2010 November V8.8: York Report. Charles Jackson tree machine. CP Express 53’6″ Woodside reefer order. Puyallup group. 2010 September V8.6: Last president’s report from David Cook. Thanks Gail Ferrier message. New execs at AGM. June BBQ pics. Order CP car. BB&BC cars ships. Chehalis, WA fun with PNW and pics. 2010 May V8.5: David Cook steps down as President. New Volunteers needed. At Auction streamliner. 2010 April V8.4: March meet pics. CP 40′ woodside reefer order. 2010 March V8.3: Trains on stamps. Once, aboard a freight train – Jack Pollard short story. 2010 February V8.2: Vancouver Winter Olympics! Monroe show pics. TTOS Island layout at the Mall. Three rail roach letter from Marchie. 2010 January V8.1: Vote extension for TTOS electi0n. Nanaimo meet pics. Royal Hudson special run to White Rock. Order CP 40′ woodside reefer Club Car. Club layout at Chilliwack pics. Russ & Barb Etherington layout under construction. Dr. Clinker’s Seasonal Blinkers. 2009 January, V7.1: Ladies appreciation, York pic. Passing of Edward White. Lionel licenses MTH for Tinplate. Atlas O Canadian Northern woodside reefer order. 2009 February, V7.2: Auction process and payments update; When life deals us snow . . .we play with trains; Munroe show update; Pics of great tinplate at auction. 2009 March, V7.3: Munroe show pics; Membership reaches a high of 104; meeting pics. 2009 April V7.4: Selling Frank Horne’s 6464’s. David Scott logowear. 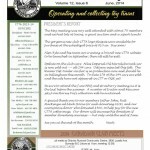 Joint meet with TTOS PNW at Bellingham; Passing of Harry Wright; Royal Hudson excursions; 4 pages of meeting pics! 2009 May V7.5: Logo wear sells. Remembering Martha Perinice & Fritz Nussli. Bill Stephenson honoured for 60 years of firefighting service. 2009 June, V7.6: Train fun south of the border; 2009 Canadian Northern club car prototype photos. 2009 TTOS National Convention. 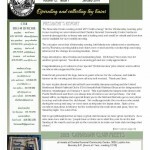 2009 September V7.7: Sights from Chicago; Special report from 2009 TTOS National Convention. Chicago – Lots of trains to check out in the Windy City. 2009 October V7.8: Mainland layout set up at Lynden show; Announcing Bellingham Bay and British Columbia Railway club car. 2009 November V7.9: Lynden & Chilliwack shows. Passing of Brian Asp. Layout corner Bill & Judy Spaulding; Mainland layout at Lynden pics. Last call for Bellingham Bay woodside reefer. Happy 29th to David Cook & Gail Ferrier. 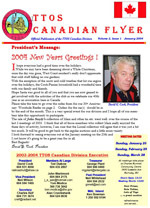 2008 January V6.1: David Cook runs for TTOS National President, Brian Fields elected. Layout corner Mike Woodley. 2008 February V6.2: Gord Hall’s Christmas layout. Could it happen here? Boy wreaks havoc playing with city’s trains. 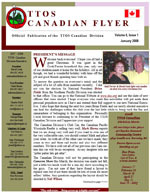 Announcing 2010 TTOS National Convention in Vancouver. 2008 March V6.3: President’s Report only. 2008 April V6.4: TTOS National Convention confirmed for Vancouver. Order a Canadian Pacific woodside reefer. 2008 May V6.5: Wear tour TTOS name tag! CP 2816 special excursion. 2008 June V6.6: Great pics from the meet Buy & Sell. 2008 July V6.7: CP Woodside reefers delivered. 2008 TTOS convention Sacramento. Summer BBQ and meet pics. A new Spin in Garden Layouts – Mike Woodley; Lionel announces Lionel Postwar Conventional Classics. TTOS Victoria Garden Party. 2008 October V6.8: AGM report. James Cook says “I Do”. 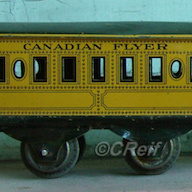 Announcing 2009 Canadian Northern reefer club car. 2008 November V6.9: Chilliwack show report & pics. 2007 January V5.1: Order form for Atlas O Grand Trunk Pacific Woodside Reefer Club Car. Notice of expenditure. November bus trip report and pics. TTOS Members get around. Club layout at Cameron show. Layout corner – Bill & Judy Spalding. 2007 February V5.2: TTOS members get around. Notice of expenditure motion for February meeting. 2007 March V5.3: Update from Cameron show and Mark Horne open house pictures. Taking orders for Atlas O Grand Trunk Pacific Woodside Reefer Club Car. Announcing TTOS Altoona Convention. 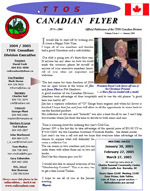 2007 April V5.4: (Title page says March V5.3) TTOS Canadian Division wins 1st & 2nd at Cameron show. Layout corner – Bill & Judy Spalding. Announcing photo slide show at next meet. Altoona convention agenda and order form for 2007 convention car – Lionel & AF 2 bay hopper. 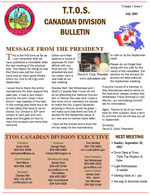 2007 May V5.5: Joint meeting with TTOS PNW division. TTOS National Convention Car order. 2007 June V5.6: Victoria Toy Show; Jim Barrett open house. 2007 September V5.7: Summer BBQ. Jim Barrett hosts a ‘how to do it’ for casting lead figures. GTP reefer still available to order. Notice of AGM. 2007 October V5.8: President’s award for Doug Crowdy. GTP reefer shipped. Passing of Tom Kozar. CNR open house photos. 2007 November V5.9: Chilliwack show report and pictures. The Brian & Wendy Kelly story, Kelly’s Caboose. Cameron Show pics. 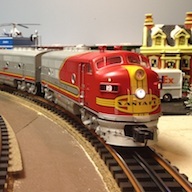 Announcing Canadian Pacific 40′ Woodside Reefer club car. Bachmann buys Williams Electric Trains. Tin plate treasures found at Cal Stewart, Pasadena. 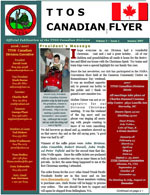 Thanks for reading and enjoying the Canadian Toy Trains Association’s Canadian Flyer !